DÉJÀ VU - we had to rub our eyes at the hysterically laughable report gracing the front of today's newspaper. Before people get up in arms, shocked and alarmed, and then go online and comment up a storm (that's what the newspaper wants and the reason why they report garbage like this) SOSA would like to make a few things abundantly clear. This (Kirra proposal) has a 100% chance of failure, however we know that odds like that never deter developers from coming up with or rehashing proposals to try and 'test the fence' and see if they can get a look in to acquire public beaches or land for themselves. This article comes off the back of a week of atrociously one-sided and unbalanced reporting by the Gold Coast Bulletin, reverting to its former ways of offering free advertorial printing for developers without question. The author of this article is either under duress or totally incapable of constructing what would constitute in any way a thorough, researched and fair story. There's little doubt that the News Corp big wigs have rattled their sabres in the direction of the current Gold Coast Bulletin editor, Ben English - who up until now has been for the most part doing an excellent job ensuring balanced and fair coverage over the broad issues of our city - and forced an editorial shift back to outputting low-quality mush, blindly promoting and stimulating focus on commercial interests, developers' rants and views, unsubstantiated verbal spew attacking governments and community groups who don't support private vested interests, fantasy cruise terminals and hysterical public land grabs. All of this has been reported with little interest in community views, fair balance, full disclosure of facts or responsible common sense articles. If the last weeks' worth of reports and articles were collectively submitted in a university Bachelor of Journalism course, they'd be thrown in the bin and the student told to start over. 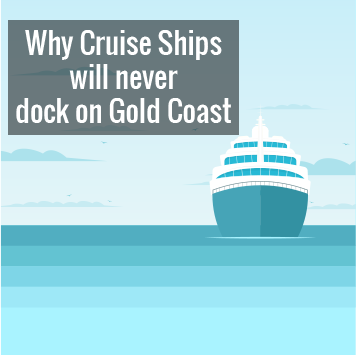 Both proposals (Spit oceanside and Kirra oceanside) are not supported by any cruise lines and blatantly have little to no basis in the real-industry requirements of major cruise lines moving forward. They have been proven to be extremely high-risk concepts, immensely unreliable, astronomically expensive and involve tremendous impacts to public amenity, environment, public parks and coastal reserves, surf breaks and more. Mayor Tom Tate initially supported the Kirra terminal idea in 2012 before backflipping and ruling it out after strong public backlash and in the interest of protecting his personal pursuit of developing large parts of The Spit and Broadwater. 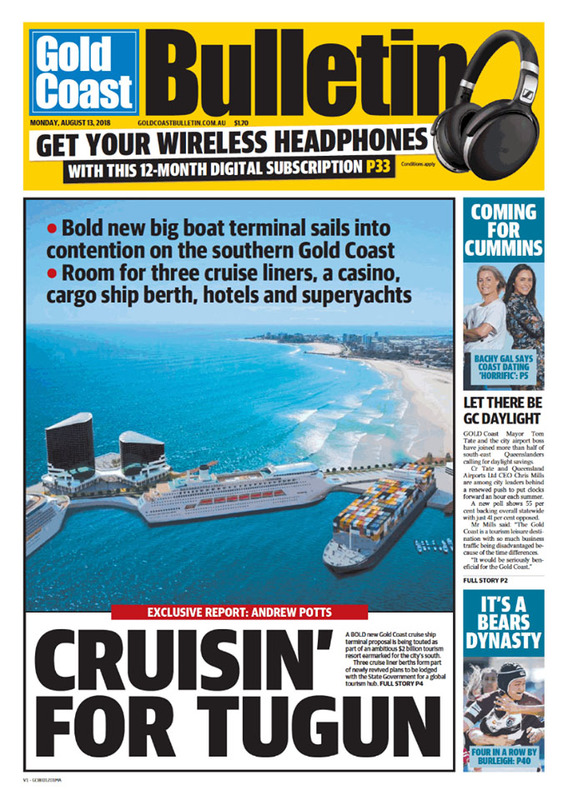 Today we see him flip again and offer in-principle support with Andrew Potts writing, "Mayor Tom Tate, who is pursuing the Gold Coast City Council’s own plans for a $500 million offshore cruise ship terminal at The Spit, welcomed the proposal." We note with particular attention that today's article failed yet again to contact a single person or organisation involved in the local surf and coastal communities in the area of Kirra and Bilinga. Failed to seek any viewpoint from the World Surfing Reserve body, boardrider clubs, any of the elder spokespersons of the local community, any local residents, Save Our Southern Beaches Alliance ... nothing, nobody. In fact, the article reads almost verbatim like a press release from the developers - unchallenged, unquestioned and save for cleaning up and editing the mayor's quotes to make him sound audibly and linguistically proficient - largely unchanged from what would have been issued by the developers. It's time for the Gold Coast Bulletin to start backing its community and readers and engage in the pursuit of honest, fair, balanced and common-sense driven reporting and publishing. The last week or so's worth or reports on Spit development and cruise terminal issues has made a mockery of the paper's 'We're for you!' campaign. And all of this amidst a period of great improvement for the newspaper, a phase in which many journalists have personally sacrificed much and invested much to restore balance to the content being published. SOSA would like to reiterate that we continue to applaud the efforts by those individuals who are digging deep to inform the community without bias or prejudice.